I am sure you all have many heroes and I thought a good blog would be to add one at a time , this way you can see what floated my boat and many of you may even have the same Iconic legends as your all time number 1 heroes as I? 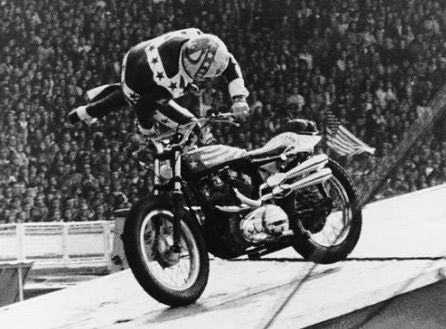 EVEL KNIEVEL was one of my all time best heroes in my teenage years, the man was fearless and many today would not attempt half he would have a go at. 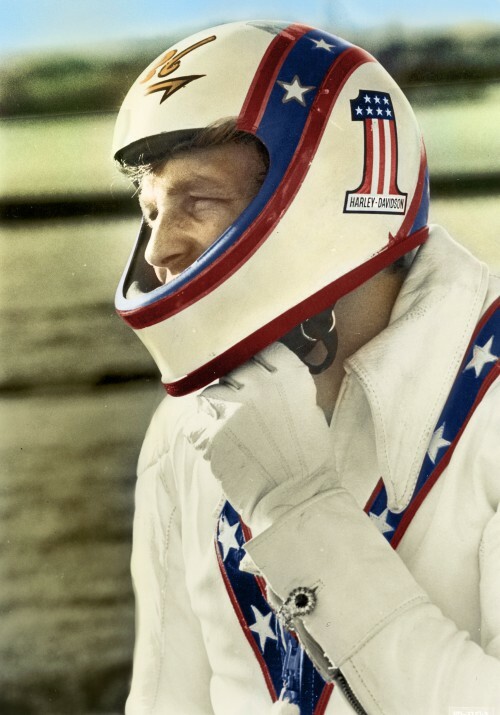 Evel Knievel, the hard-living, death-defying adventurer who went from stealing motorcycles to riding them in a series of spectacular airborne stunts in the 1960s and ’70s that brought him worldwide fame as the quintessential daredevil performer. 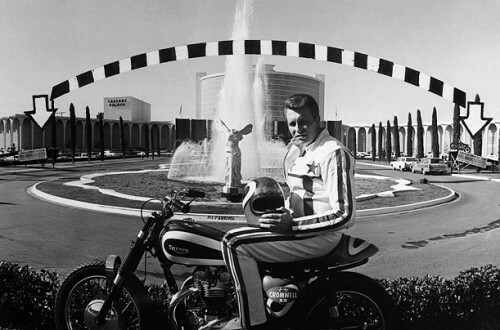 Mr. Knievel amazed and horrified onlookers on Dec. 31, 1967, by vaulting his motorcycle 151 feet over the fountains of Caesars Palace in Las Vegas, only to land in a spectacularly bone-breaking crash. 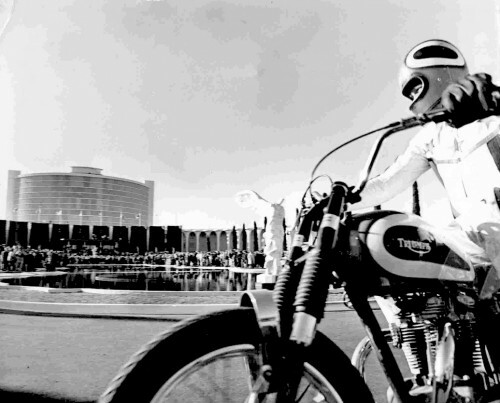 He then continued to win fame and fortune by getting huge audiences to watch him — typically dressed in star-spangled red, white and blue — roar his motorcycle up a ramp, fly over 10, 15 or 20 cars parked side by side, and come down on another ramp. 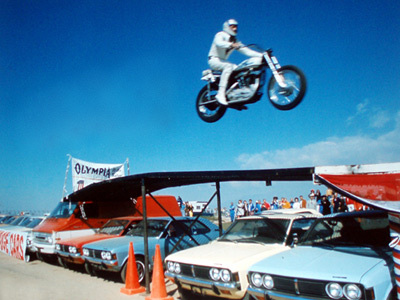 Perhaps his most spectacular stunt, another disaster, was an attempt to jump an Idaho canyon on a rocket-powered motorcycle in 1974. 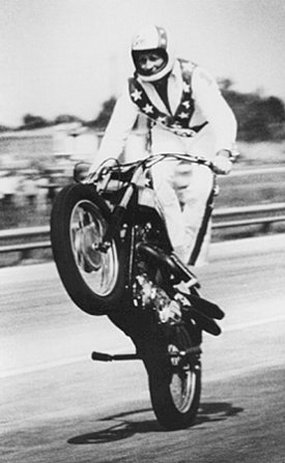 Mr. Knievel’s showmanship, skill and disdain for death were so admired that he became a folk hero. John Herring’s song “Evel Knievel” was a hit, and both Sam Elliott and George Hamilton have played him in movies. 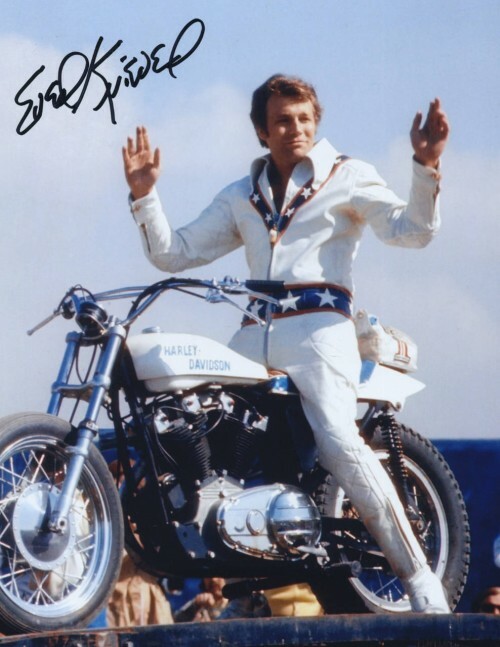 In 1977, Hollywood tried to make him into a movie star in “Viva Knievel!,” a film with Gene Kelly and Red Buttons. 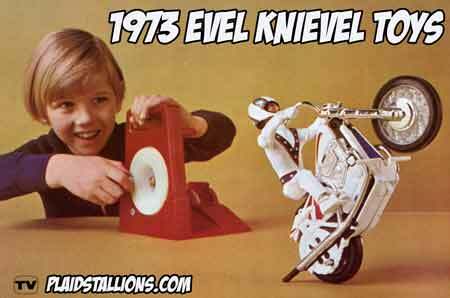 In the 1970s and ’80s, Evel Knievel toys had sales in the hundreds of millions for Ideal and other companies. For a 1994 exhibition titled “America’s Legendary Daredevil,” the Smithsonian Institution acquired Mr. Knievel’s customized Harley-Davidson XR-750 — the museum called it one of the few motorcycles to survive his career — and Mr. Knievel donated a star-spangled leather jumpsuit, cape and boots that he wore during jumps. By his own account, he underwent as many as 15 major operations to relieve severe trauma and repair broken bones — skull, pelvis, ribs, collarbone, shoulders and hips. 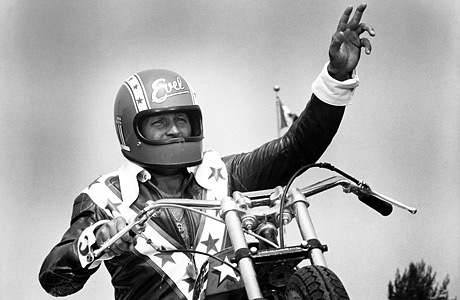 “I created the character called Evel Knievel, and he sort of got away from me,” he said. He had a titanium hip and aluminum plates in his arms and a great many pins holding other bones and joints together. He was in so many accidents that he occasionally broke some of his metal parts, too. His health had also been compromised by years of heavy drinking; he told reporters that at one point he was consuming a half a fifth of whiskey a day, washed down with beer chasers. Robert Craig Knievel was born in the copper-mining town of Butte, Mont., the son of parents who broke up when he was young. He was reared by grandparents. 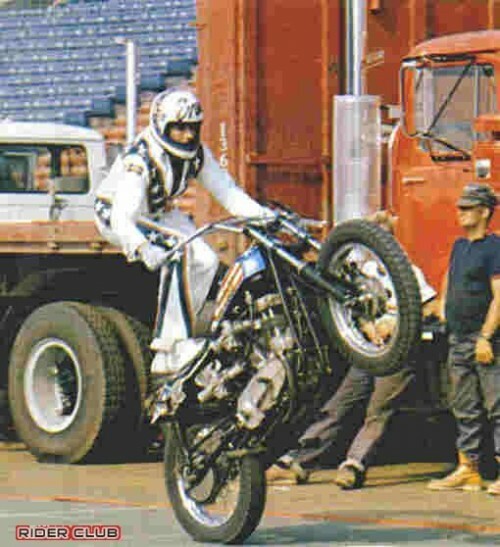 They decided to call Robert “Evil Knievel.” The name stuck, and some years later, Mr. Knievel legally took the name Evel, changing the “i” to “e” because, he said, he thought it looked better. As a boy he was inspired by the exploits of Joie Chitwood, an acclaimed stunt-car driver. 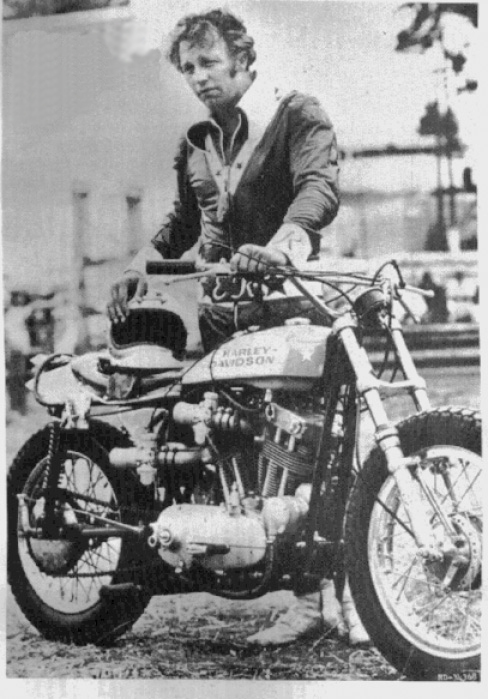 In an interview with The New York Times in 1974, Mr. Knievel said his first motorcycle was a Harley-Davidson, which he stole when he was 13. Three years later, his grandmother bought him a Triumph. In Butte, he was a standout athlete in track and field, ski-jumping and ice hockey. Joining the Army in the 1950s, he volunteered to be a paratrooper and made 30 jumps. Afterward he played semiprofessional and professional hockey, for a time with the Charlotte Clippers of the Eastern Hockey League. 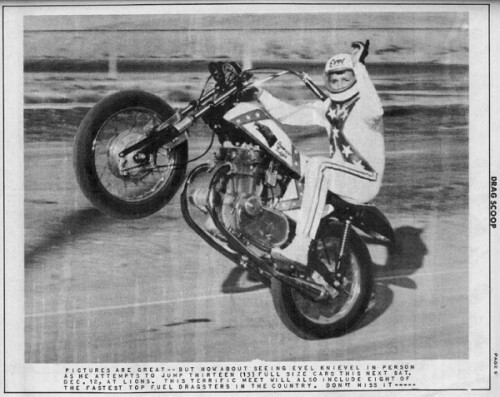 Then he took up motorcycle racing full-time until falling and breaking bones in a race in 1962. When he was 27, he became co-owner of a motorcycle shop in Moses Lake, Wash. To attract customers, he announced he would jump his motorcycle 40 feet over parked cars and a box of rattlesnakes and continue on past a mountain lion tethered at the other end. Before 1,000 people, he did the stunt as promised but failed to fly far enough; his bike came down on the rattlesnakes. The audience was in awe. His stories about himself were no less extreme. He said he had twice kidnapped his hometown sweetheart, Linda Bork, and married her after the second time. He said he had robbed a service station of $900 when the owner failed to pay off a $25 bet. He said he had worked as a card shark, a swindler and a safe-cracker. How much of it might have been said to call attention to himself remained unclear. 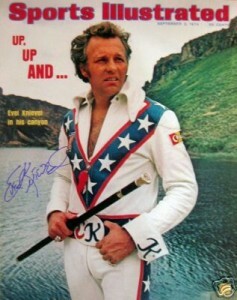 In 1974, Mr. Knievel decided he would jump 1,600 feet across the Snake River Canyon in Idaho. 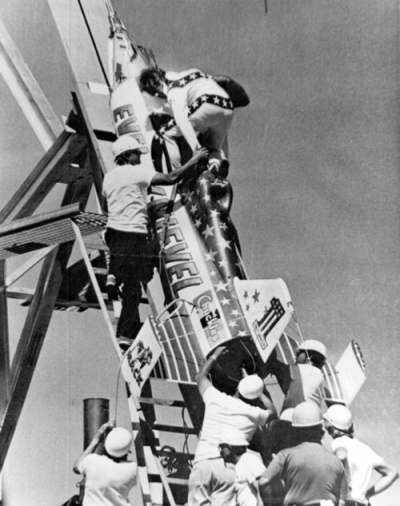 Before thousands of spectators and thousands more on a closed-circuit television broadcast, he took a rocket-powered motorcycle up a 108-foot ramp at 350 miles an hour and soared some 2,000 feet over the canyon floor. But his parachute opened prematurely, and he and the cycle drifted to the canyon floor, leaving him without serious injury. For his efforts, he made $6 million. 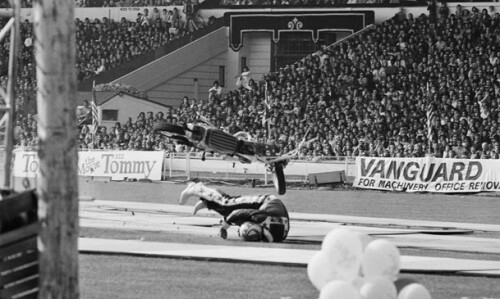 He also made good money the next year when he went to London and jumped his motorcycle over 13 double-decker buses at Wembley Stadium. 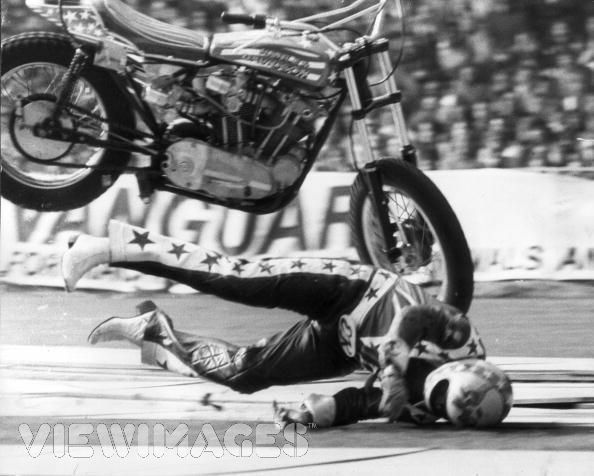 He crashed there, too, breaking his pelvis, vertebrae and hand. He soared over an aquarium tank containing 13 sharks in Chicago but skidded on the exit ramp and fractured his right forearm and his left collarbone. It seemed he could not think of things big enough to jump over. At one point, he announced he would jump over the Grand Canyon with his jet-powered motorcycle. He even retained the lawyer Melvin Belli to help him get permits. But the Department of the Interior said no. In 1977, Mr. Knievel was convicted in California of beating his former press agent with a baseball bat and sentenced to six months in a jail. 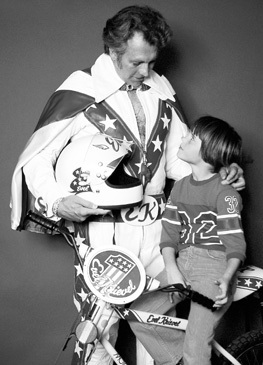 The agent, Sheldon Saltman, had written a book that Mr. Knievel felt had treated him unfairly. 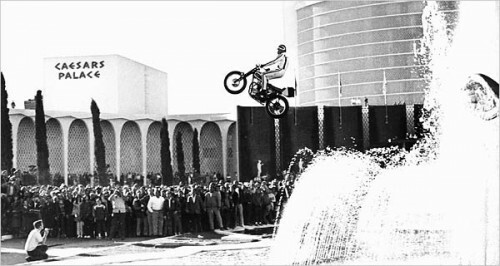 The conviction had a devastating effect on sales of Evel Knievel toys. 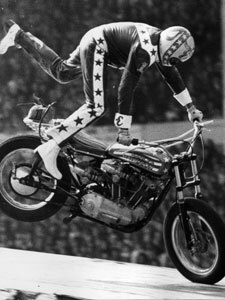 Mr. Knievel was forced to spend the entire six months in prison after a judge learned that Mr. Knievel, under a work-release program, was commuting from prison to his job in a chauffeur-driven Stutz convertible and providing other inmates with limousine transportation to their work-release jobs. But his troubles continued. In 1986, he was fined $200 in Kansas City, Mo., on charges of soliciting an undercover policewoman for immoral purposes. And in 1995, when he had left his wife after 38 years of marriage and was living with Krystal Kennedy, a younger woman, Mr. Knievel was charged with battering her. Ms. Kennedy declined to press charges, however, and later married him. 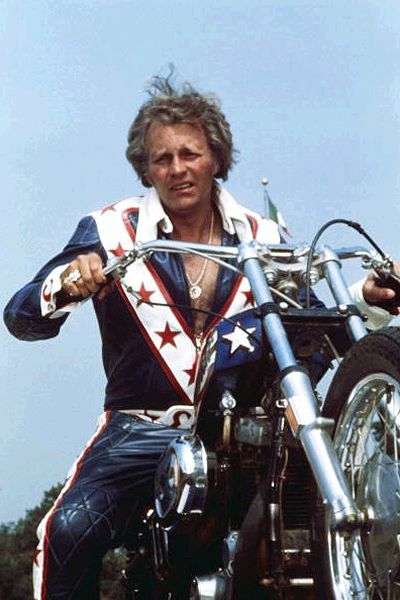 In 2006, Mr. Knievel sued Mr. West, the rapper and producer, and his record company over a 2006 music video for the song “Touch the Sky,” in which Mr. West portrays “Evel Kanyevel,” who tries to ride a rocket-powered motorcycle over a canyon. 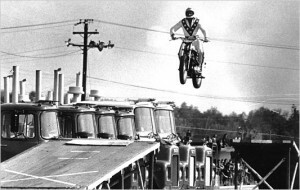 “We settled the lawsuit amicably,” Mr. Knievel was quoted as saying this week. After retirement, he continued to make public appearances and promote his son Robbie’s career. Mr. Knievel and his wife Linda Bork separated in the early ’90s. In addition to their son Robbie, they had three other children, Kelly, Tracey and Alicia. Mr. Knievel’s marriage to Krystal Kennedy, in 1999, ended in divorce, but they remained together, splitting time between homes in Clearwater and Butte, The A.P. said. He had 10 grandchildren and one great-grandchild. 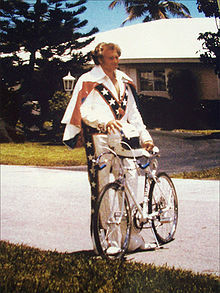 Evel Knievel, not a name but, a verb.